Eye for Film said of Zaytoun, the latest film from Lemon Tree director Eran Riklis, "Even though the pieces of the Zaytoun puzzle do not slot together harmoniously, the whole remains more engrossing than a more cohesive but less ambitious picture," while Variety assures us it has an "all-but-unspoken subplot that haunts the entire production, and elevates its story above and beyond the mere romantic-political thriller many viewers will presume it to be." Oh really. 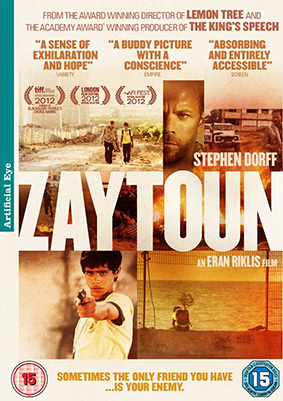 You can check for yourself when Zaytoun is released on UK Blu-ray and DVD on 8th April 2013 by Artrificial Eye at the RRP of £19.99 for the Blu-ray and £15.99 for the DVD.